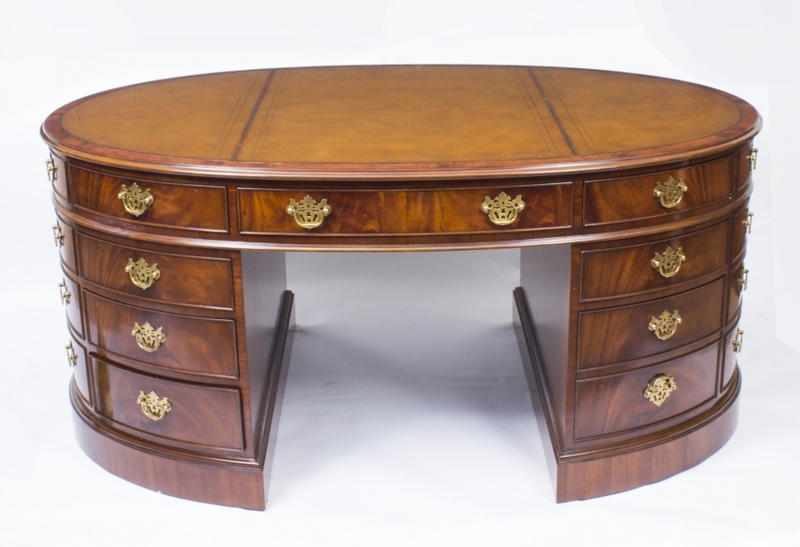 We feel fantastically privileged to present this fabulous flame mahogany lion’s head Chippendale partners desk. It is an exact replica of the desk supplied by Thomas Chippendale to Sir Rowland Winn in 1767 for his residence, Nostell Priory in Yorkshire and, in our view, demonstrates the highest standards of the cabinet maker’s craft, representing all that is finest from the 18th century – perfect proportions, fine cabinet making and carving of the highest quality. The original of this Chippendale partners desk is owned by the National Trust and still resides at the site of the former Nostell Priory, now a beautiful Palladian style house, the current home of Lord St Oswald. The desk has been wonderfully crafted from flame mahogany and is finished all round so it is free standing. 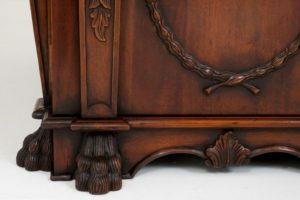 The desk features fabulously carved lion’s heads, with acanthus and laurel details, and it stands on elegant lion’s paw feet. Carved from solid mahogany, the craftsmanship is of the highest order, surely the work of a master carver. This Chippendale partners desk is identical on both sides, with the cupboard doors on one side each opening to reveal a bank of four graduated drawers, all lined in solid mahogany with brass drop handles, and a central frieze drawer. The doors on the other side open to reveal a drawer above four vertical file dividers and a central frieze drawer. To cap it off, the top is lined in the finest olive green gilt-tooled hide. 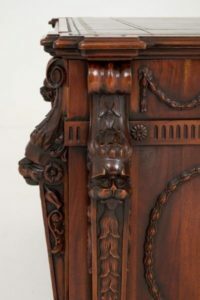 We cannot overstate the significance of this piece; it represents the very pinnacle of the cabinet maker’s craft. It may interest you to know that Christie’s sold a similar replica Thomas Chippendale desk, by London furniture makers Arthur Brett, for £221,000 in March 2017. 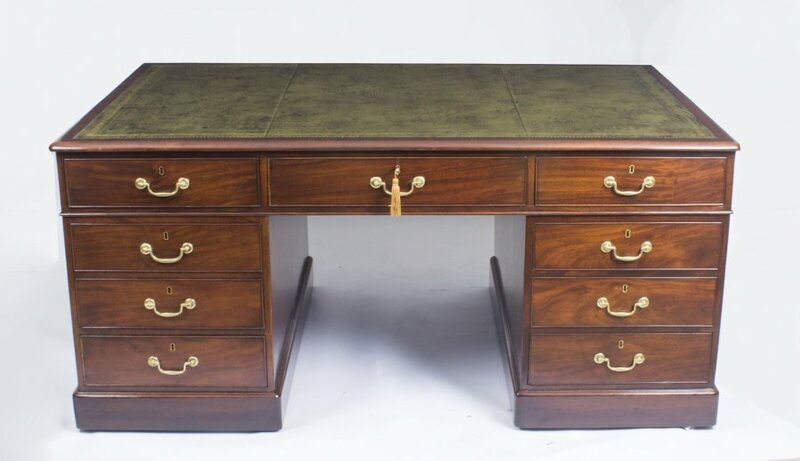 This stunning Chippendale partners desk will bring style and beauty to your home like no other piece and is certain to become the shining centrepiece of your furniture collection. This Chippendale partners desk is in a great condition having been beautifully cleaned and polished in our workshops as can easily be observed in the photos we have included in our set of pics. Kindly take a couple of minutes to take a look at them and assure yourself of this. 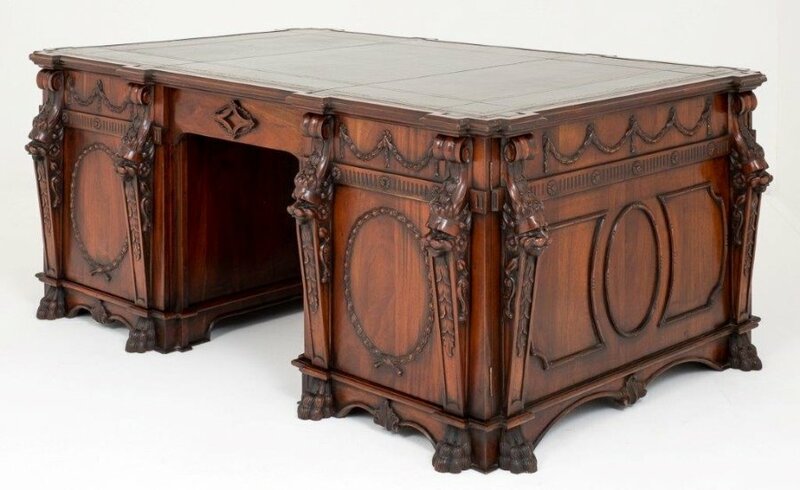 We’re sure you will agree that it’s a good idea to view valuable collectibles such as this Chippendale partners desk in-person before you buy. Keeping this in mind, we are always pleased to greet customers at our North London salesroom to see this great Chippendale partners desk personally. Whilst you are here you will also be able to go over our comprehensive range of other marvelous pieces and also speak about any points or issues that you could have. 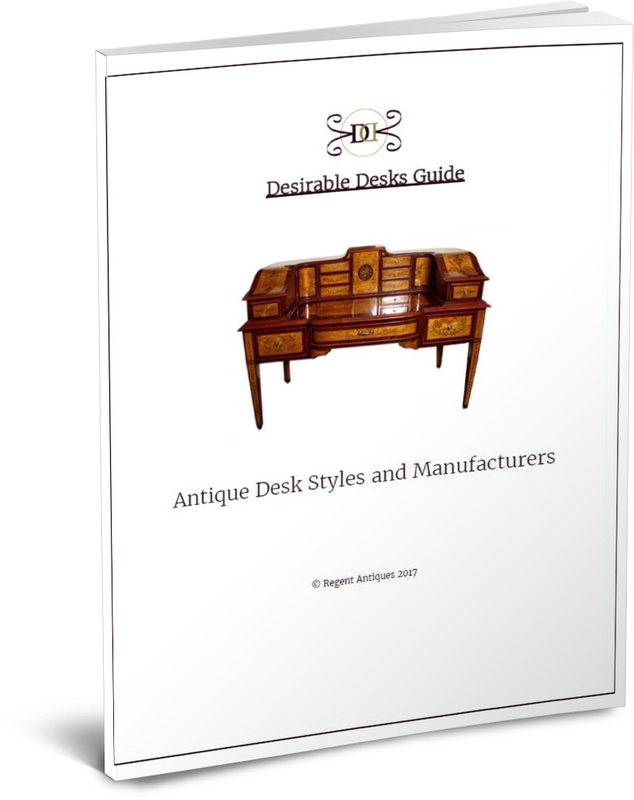 Our internal specialists are handy to respond to queries, not only about this Chippendale partners desk but also about antiques and collectibles more generally. They’ve a quite a bit of expertise and are always pleased to advise. Please ring ahead of time to get a consultation so that we can be sure we have the right specialist on hand to help you. From time to time we open on Saturdays, so if you need to come at a weekend, please get in contact ahead of time to be sure we will be open. We want to avoid you making a wasted trip. When making contact with us please make certain that you have the item reference number at hand – 09087– so we can be sure which specific item you wish to discuss. Please click on the ‘Find Out More’ button to get our contact details. Our London showroom is open Mon to Fri 10am – 5pm for you to see this Chippendale partners desk. We also open from time to time on Saturdays – but please ring ahead before taking the visit on a Saturday to ensure we will be open as we don’t wish you to be let down. Please click on the ‘Find Out More’ button to get our contact details. 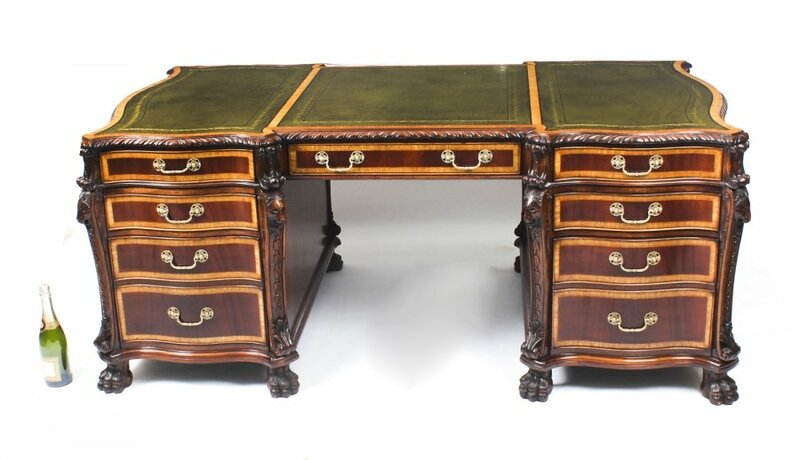 If unfortunately you are unable to visit us, then we are always pleased to reply to any requests you might possibly have about this Chippendale partners desk by email or phone. We have internal advisors who will be ready to support you with any aspect of your proposed acquisition, so why not take the opportunity to get more information. When you make contact please be sure you quote the item reference number so we know which of our numerous objects you are referring to. You can find both our email address and our phone number by clicking on the ‘Find Out More’ button. Great items such as this Chippendale partners desk have to have expert packing and transport to ensure they get to you in the same condition that they left us. We take great satisfaction in our shipping know-how and can deliver to almost any destination globally. However, we ask you to get in touch to discuss transport arrangements and obtain a quotation prior to making any acquisitions, as we will need to be sure that we can meet all your transportation expectations. As you will recognize, some things need to have sensitive handling and we will need to make sure that everything is available to get it to you safely. Please quote the item reference number for this Chippendale partners desk when getting in contact so we know precisely what the shipping requirements will encompass. You will be pleased to know that shipping is free to any mainland UK address. 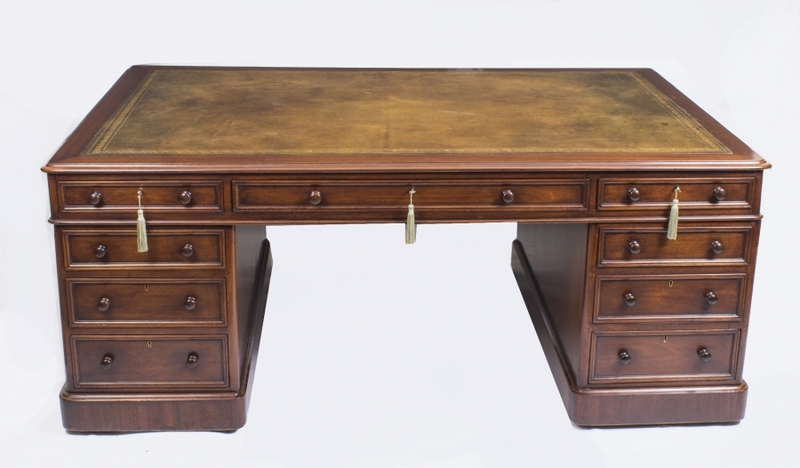 If you are not pleased with this Chippendale partners desk, we offer a 14 day money-back guarantee in conformance with the Distance Selling Regulations. If you do choose to return it, you will need to pay the return shipping charges, unless we sent you an item materially different to what you were anticipating or have mis-described it in some material way. You must send the article back in its’ original condition and packaging. You are also accountable for any customs duties, taxes or fees that fall due outside the European Union.